Hibs goalkeeper Mark Oxley today fired a warning to high-flying Rangers: You wrote us off last season – do so again at your peril. The Easter Road outfit were cast as also-rans in last season’s Championship race after suffering a slow start but, although they failed to rein back title-winning Hearts, Alan Stubbs’ players did pip the Ibrox club to second place. Now the Capital club find themselves in a similar position, Rangers’ turbo-charged start having prompted some to predict they’ll be champions by February while some west coast-based newspapers have even debated just what’s needed for the Ibrox club to compete with Glasgow rivals Celtic at the top of next season’s Premiership. But, Oxley insisted, all such talk has been totally ignored by him and his team-mates. He said: “That’s the job of the press, to write stories. We’ll just concentrate on our job. We are happy to stay under the radar. Last season it was all Hearts and Rangers, people were writing us off. 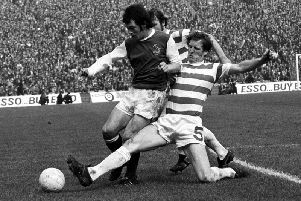 Sunday’s showdown has, of course, been a topic of conversation for a number of weeks, conveniently overlooking the fact both clubs had fixtures to fill in the interim, Hibs facing a particularly testing schedule with away trips to Falkirk – a rearranged game they had in hand over Rangers – and Raith Rovers, two sides boasting unbeaten home records. Stubbs’ players emerged from those matches with a maximum six points, two hard-fought victories cutting the gap between themselves and Mark Warburton’s side to eight points and extending their own unbeaten run to ten games, results and performances which, Oxley insisted, has left them brimming with confidence. He said: “Big games like this are the ones you want to play in, you can’t wait to play in them. But as the manager said before Saturday’s game, there’s no good talking about Rangers if we hadn’t set it up with a good win at Stark’s Park. I’m not sure it was a good win, but it was a win and that’s all that matters at the end of the day. Hibs temporarily trimmed Rangers’ advantage to five points with goals from John McGinn and Jason Cummings being enough to beat Raith, but Jason Holt’s strike 24 hours later against St Mirren allowed the Light Blues to edge that little bit further ahead once more. A Jon Daly header pulled Raith back into the match at the weekend but, as they had done at Falkirk a few days earlier, Stubbs’ players withstood all that the opposition could throw at them and that, Oxley claimed, shows just how resolute Hibs have become, only seven goals conceded in the league the second-best defensive record in Britain behind Sunday’s visitors. Referee George Salmond added an extra nine minutes, the length of time questioned by Stubbs and an eternity as far as the travelling support were concerned as they watched their side hang on to claim a fourth straight victory. And that, Oxley insisted, is the difference between this season and last. He said: “One thing I knew I had to improve was concentration. I think last year we conceded goals in the final ten minutes more than we wanted to and that’s something we have been looking to improve. Oxely famously scored what proved to be the winning goal against Livingston on the opening day of last season and if he hasn’t quite emulated that feat, he can, at least, claim an assist for Cummings’ tenth of this campaign, his long clearance foxing the Raith defence as the 20-year-old took the ball down on his chest and lofted it over goalkeeper Keith Cuthbert who had earlier been beaten by McGinn’s thunderbolt. “The pitch at Stark’s Park probably isn’t as big as Easter Road,” explained Oxley, “and there was a bit of wind behind my clearance that carried it through to Jason but the way he brought it down and put it over the keeper was magnificent.